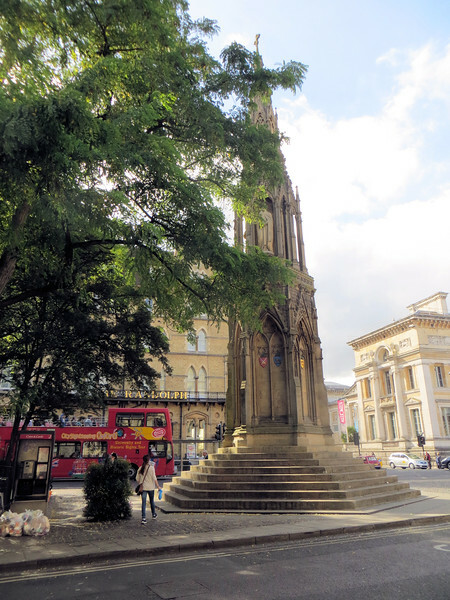 This is the Oxford landmark called "The Martyr's Memorial." It was built in 1843 to commemorate the deaths by burning of three Protestant churchmen in 1555 and 1556. Nicholas Ridley, Hugh Latimer, and Thomas Cranmer are collectively known as "The Oxford Martyrs." They were executed by the Catholic Queen Mary Tudor for refusing to recant their Protestant faith.